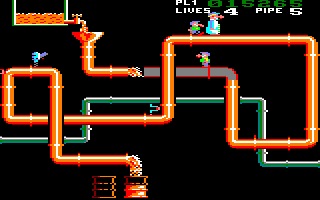 This is a rather surreal game where tools are running amok and causing pipes to leak, and you have to fix them by getting your two trusty helpers to do it. On each level there is a tank, and a certain number of barrels have to be filled with water, and if the tank runs out, your score will start to decrease. The helpers can also be used as shields, and if they die, you can collect another one. The graphics are brilliant and the sheer fun of the game is complemented by the catchy music; once you listen to it, you won't forget it easily! Sam Short is out to capture the notorious Boris – a slippery character indeed. Hiding somewhere within the fortress, you roam from room to room collecting parts of a cage – the only thing that will contain him. Nasty creatures pace around which deplete your energy, unless you can find a syringe. Finding this object turns you into Super Sam and makes you invulnerable for a short time. Be careful not to fall down the manholes, and look out for booby-trapped rooms! 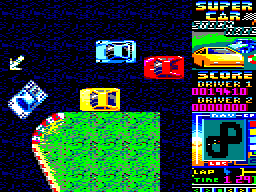 The graphics are very basic with some flicker and colour clash. 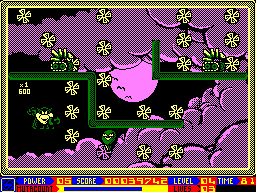 A cheerful tune is available, although it can be turned off to allow the game to be played with sound effects only. Take on the challenge of motorbike scrambling as you negotiate fifteen gruelling courses. The obstacles waiting for you include streams, logs, loose stones, oil barrels, and even Volkswagen Beetles that you must ride your bike over! You must complete each course within the required time, and you'll be penalised for any mistakes you make. If you fail, the game is over, and you must start again from the beginning and attempt to complete all the courses all over again. That is what really ruins this game. Detailed graphics and two great tunes can't make up for this. The Earth has been contaminated with toxic waste, and Seymour has to clear up the mess. 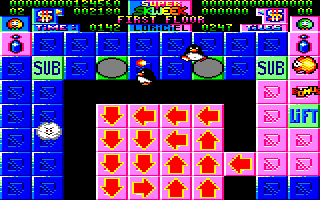 Each level takes place on a single screen and you must collect the tokens scattered about the screen, as well as jumping on the heads of mutants to kill them. 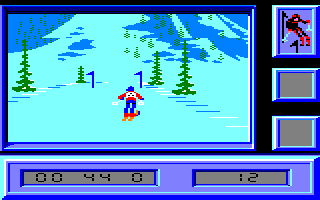 The graphics are average and the backgrounds (which vary only on the 128K version) aren't great, either. The sound is below average, and to be honest, the concept of the game has really dated – it won't hold your interest for very long. See also: Sergeant Seymour Robotcop, Seymour at the Movies, Stuntman Seymour, Wild West Seymour. Known as Eddie Edwards Super Ski in the UK after the hopeless but lovable ski jumping hero of the 1988 Winter Olympics, you can take part in four different events – two types of slalom, the descent, and the jump. In the slalom events, you have to steer between the flagpoles; miss them and you will be penalised. In the descent, you just head for the finish at full speed, although you still need to pass through some gates to avoid being penalised. You can also practice the events, and in the slaloms and descent, there are three tracks to choose from in each event. The game is a thrill to play thanks to the screen being updated really fast, while still having some remarkably beautiful graphics, with the Alps looming in the horizon – it's excellent! Skweek is back and ready to paint everything pink! As in the last game, there are 99 levels and the same set of monsters to confront. However, there are several new power-ups and even a shop where you can buy them. The money can be collected by shooting monsters. In addition, most levels have more than one floor, so you'll have to use the lifts. The original Skweek is in my opinion one of the best CPC games of all time, so it's a shame to see that the sequel is much worse, and lacking in the main thing that made Skweek such fun – speed. It is much slower, and it absolutely crawls when there are several monsters on the screen. The graphics aren't as good and there's very little sound, and overall, the game is disappointing. See also: Skweek, The Tiny Skweeks. This is a poor conversion of the coin-op game which attempted to revive the classic Space Invaders and bring it in line with the 1990s. There are twelve levels, each with a different background, and with three waves of aliens to fight. 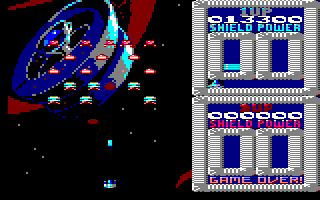 Shooting the aliens that fly along the top of the screen now gives you to chance to collect a temporary power-up. There is also a two-player option if you want to play with a friend. What makes it poor is that the backgrounds are very blocky and often garish, and it becomes difficult to see the aliens you're trying to kill, and the missiles that they fire. The movement of the aliens is also slow and jerky. The music is really good, though. Five very mixed events make up the Super Sports Olympic Challenge – target shooting, daredevil diving into a small pool of water, tile smashing karate-style, and swimming through a lake filled with hazards such as jellyfish and even mines! Up to four players can play, and you can also practice any of the events. Gilbert the commentator is also on hand throughout the events to offer encouragement or criticism of your efforts. The graphics are colourful and very nicely drawn, and each event also has a short piece of music which plays before the start of the event. Overall, it's an enjoyable game to play, especially if you can find someone else to compete against. 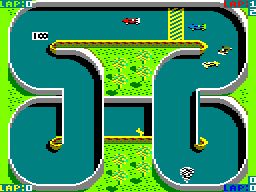 This is a racing game viewed from overhead in which you compete against three other cars (or two in the two player mode) and try to win on all eight tracks; if you don't win, the game is over. You also have to avoid tornadoes (!) and oil slicks on the track, which will cause you to lose control of your car. You can also collect spanners, and if you collect three of them, you can make improvements to your car. 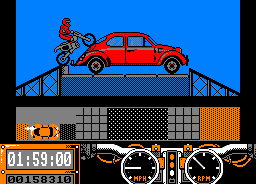 While the graphics are average, the only sound effects are engine noises, and the gameplay is very limited. Four high performance cars – a Lamborghini Countach, a Ferrari Testarossa, a Lotus Esprit and a Porsche 959 – race each other around several small tracks. It's not really a stock car race, eh? Your aim isn't to win the race; instead, you need to complete a certain number of laps within the time limit. This is easy on the first few tracks, but later on, you'll have to complete more laps in the same amount of time. The graphics and animation are both excellent, with really chunky, colourful cars and lots of fire and smoke when they crash into each other. The high-energy music is marvellous and really suits the game as well. However, the cars can only point in eight directions, and the controls are a bit unresponsive. Without these problems, I would have enjoyed the game a lot more.